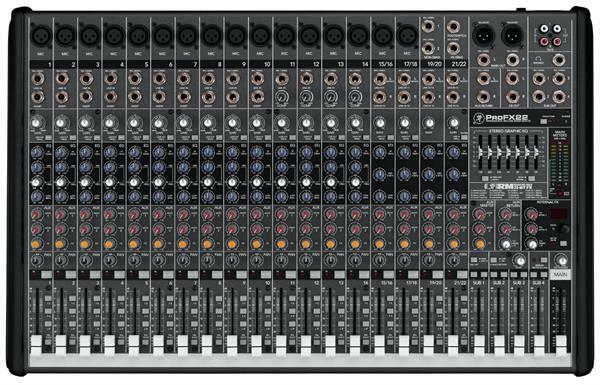 Mackie brings good mixers to the market with nice performance and full-fledged reliability. The EQ or Equalizer function you would find on any Mackie mixers is one of their main selling points. The sound quality too is good and best suited for live performances with clean delays, reverbs and a fully adjustable EQ where you control your performance on the go. You want your mixers to provide the best sound reproduction while you are on stage and want it to give the best feel you can give to your performance, which means that sound mixers play an important role in generating the best sound suited for your performance. This means that when you want to choose a good mixer for your band, team, you are always purposeful and adamant. I think, personally speaking this Mackie's Pro FX series could be your answer. These four mixers are designed to suit your needs on stage while performing live, your practice sessions etc. The three different variants are almost similar but differ in the number of channels and also some of the special features which you will not get in the base 8 and 12 channels, whereas 16 and 22 variants have it. Depending on your requirements and how many inputs you are interested in, you can go for these variants ranging from the base 8 channel models to the premier 22 channels variant. All these variants are really specific in their own right and will give only that much which you are really paying for, nothing more nothing less, but I can say that there is not much difference between all these variants. The only major difference which comes in the way is between the 12 channels variant and the 16 channels variant, and to be frank there is not that much of a difference, making it a best buy. If your performance has to be justified, there has to be good sound generating systems especially the amps, speakers and a good mixer. These Pro FX series mixers will give that source of impetus. If you are to generate the same sounds as these mixers produce, you will need more than 10 feet tall racks and a bunch of output gears to accomplish what this one little mixer does. To make things even more interesting is the ease of use of these mixers which makes it even more desirable. I will be focusing on the 16 channels variant because all the mixers are almost identical and the little difference which is eminent will be pointed out as this review progresses. You may think what is there to speak about the design of a mixer because almost all mixers are identical, may be, but for me each and every mixer has its own signature style and design. I have been a big fan of Studiomaster mixers for a long time till one of my friends purchased one Mackie. That absolutely changed my views about a mixer and I started to think and focus about different brands as well, other than a Studiomaster. What I loved about Studiomaster was the peculiar rectangular design which always stood away from the rather box type design of other brands like Yamaha and Mackie. When I first started to really get to know about Mackie, I was feeling a little bit more interested in Mackie models. 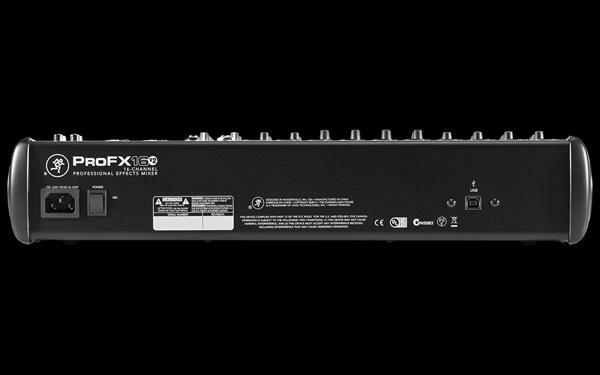 Here the Pro FX series mixers are typically designed in the Mackie way, and at the first look you can identify that it is a Mackie product. Depending on which one you are going to buy, the design or the size of the mixers will grow bigger and better. The base 8 and 12 channels variants will not be that much good in the design department whereas the premium 16 and 22 base channels variants look extremely superior to other models. Here I would say the 22 channels variant is one of the best designed mixers you will find in the market today. The knobs, buttons, switches, the colour schemes, the ports and everything you will find on this mixer are crafted meticulously and carefully with great attention to detail. I would say this is one of the best design architecture you will find. If you are a mixer freak like me, you are going to love it and even if you are not you are going to love it. I would rate this design attempt from Mackie 4.9 stars out of 5. The build quality as you would expect from a good brand is more than exceptional. Really Mackie has done a lot of hard work in making it the way it is. A strong solid steel chassis protects your investment, tough ABS side protection and the legendary Built-Like-A-Tank design is not a mere slogan it is as strong and sturdy as it gets. 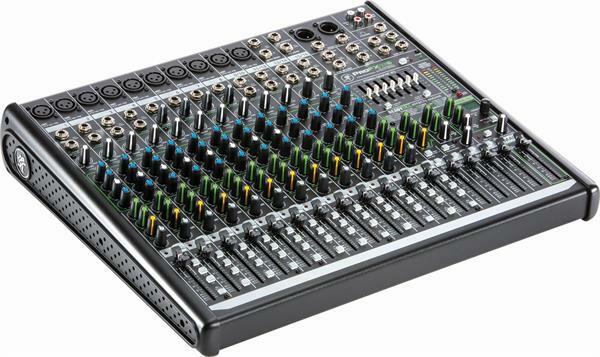 Professional 4 Bus live sound mixer with on-board effects and USB I/0. Low noise, high headroom Mackie mic preamps with +50dB gain range. Dedicated inline compression for critical inputs. 32-bit RMFX™ processor with "Gig Ready" reverbs, choruses and delays. Precision 7 band graphic EQ for tuning mains and monitors. USB I/O for recording shows and music playback via Mac or PC. These are some basic features, even though there are a long list of features, could mention only these important ones. Others are relatively similar on almost all mixers available today. The inline compression for critical inputs is a function which helps you to control those inputs where there are a lot of variations or the dynamics go up and down a lot like the vocals, bass guitars or snare drums. It is a great feature which works superbly when executed well. For instance there are MIDs in the EQ in the 16 and 22 channels variant which is really smooth and provides a great platform for fine tuning vocals. The smoothness of the MIDs is one of the striking features of the mixer, unfortunately this luxury is not found in the base 8 and 12 channels variants. The only reason for it being excluded from the base versions could be the price point, because other than that these mixers are almost identical. Individual mute switches are provided on all the channels for the corresponding EQ which is a good offering. All these four mixers in the Pro FX series have their own internal FX which is important in eliminating all the unwanted effects and delays you would probably never use during your live performances. One of the good things is that there is a pre-set of common delays, reverbs and choruses which you would commonly use during your performance. The same 7 band graphic EQ is found on all the four mixers for EQing your left and right mains which is quite superb. For me the best part of this is the USB port by which you can directly stream your music through your iTunes, iPod or from your PCs. This is the best feature. On the channels 15 and 16 there is a button called USB, when you press it, all of a sudden you are streaming music directly into your channels 15 and 16 which is a great utility when you need to fill your performance with tracks or music when two or more bands are performing, and this is a great feature. It doesn't end here; you can even record the music into your computer directly from the console. You can use it with the software which comes along with the mixer or with any standard DAW which you will find in the market. You can also plug in your condenser microphone, it is very easy to rout because of the standard facilities available for the same on- board. I think I have given a lot of information about the special features and by which you can imagine how brilliantly all the four mixers work. The sound quality is superb, the EQing and the shifting is quite smooth and what more would you ask for? 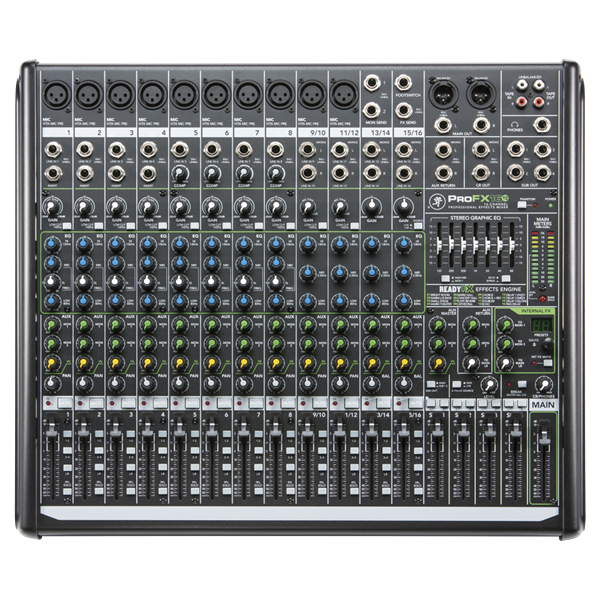 My personal favourite is the premium 22 channel variant even though all the four mixers perform relatively in the same manner. One of the main reasons to go for this Pro FX series is the ease of use of all these four mixers. You will be always satisfied with the performance of these sound Gigs. Pros: Superb sound quality, 32-bit RMFX™ processor with "Gig Ready" reverbs, choruses and delays, superior, rugged and reliable design, USB port a great utility, easy to use, four different channel variant an useful one. Cons: The premium 22 channel variant could have been a little cheaper. These offerings from Mackie are absolutely a great one, as you can see I did not notice any cons to say other than the one mentioned. You can go for all the variants according to your need but I would insist that you go for the 16 channel variant. As I stated earlier the premium 22 channel variant is a bit too pricy so going for the 16 channel variant can be good option. If you want only the 8 or 12 variants for your own practice sessions then you can go for that as well. With the sound quality and the individual EQing ability makes it one of the best buy. Hope this article is useful. Keep playing. Keep enjoying. God bless.